Ann and I left Woodstock, GA, at noon on Saturday. The temperature was 95 degrees. We turned north onto I-77 from I-85 at Charlotte. The temperature was 99 degrees. We stopped in Cana, VA, at the Willow Glen Farm B&B. The house was amazing, the food excellent, and Bob and Carol were gracious and interesting hosts. After the great breakfast on Sunday, we drove north on Highway 52 to Fancy Gap and turned right onto the magical Blue Ridge Parkway. The Blue Ridge Parkway is a wonderful place to drive after spending hours dodging collisions on the interstate highways. 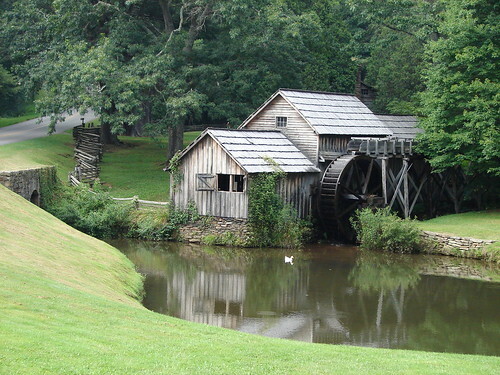 We passed beautiful Mabry Mill, where hometown friend Clift Mitchell fell in the pond about 50 years ago. We drove east through Floyd County to Cannaday Gap, where we dropped down into Franklin County to Endicott. We drove east to Ferrum. At Ferrum College, we turned north onto Ferrum Mountain Rd towards Callaway. We continued north to the Blue Ridge Parkway. We turned northeast on the Parkway. Several miles later we turned left onto a barely visible double track. When we stopped to open the gate to drive into a pasture, the temperature was 74 degrees with very gusty winds. We drove through the pasture to Jack and Marie's home. We had a tasty and healthy lunch with Jack, Marie, Jackson, and Katie. It was great to see them and I wish we had had more time to visit. We returned to Franklin County and looked at some property with Clift, Linda, and John G.
At 3pm, we left for Atlanta. We stopped at the Floyd Country Store in Floyd. I got a blackberry milkshake and we chatted with Woody and Jackie for a moment. We headed west on Highway 221. At Hillsville, we took I-77 south. We encountered a traffic stoppage at Statesville. We detoured onto I-40 West and took Highway 321 South to I-85, after losing an hour to the traffic jam. We arrived home at 11pm. The temperature was 88 degrees. Hot 'Lanta indeed.